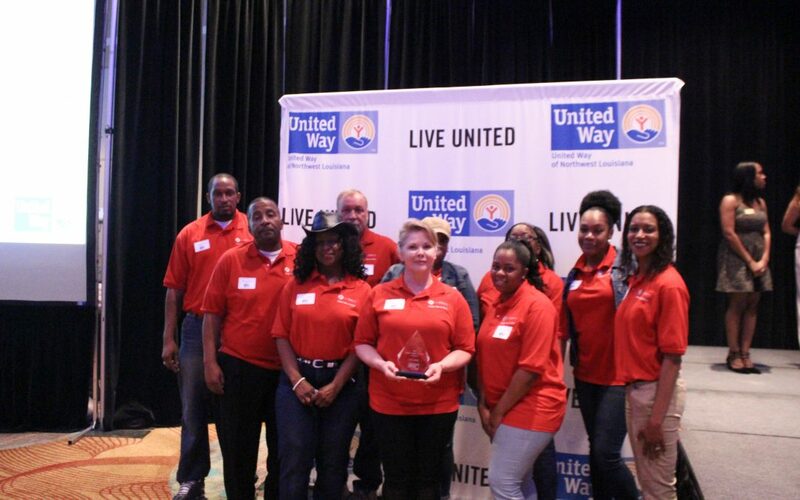 SHREVEPORT, LA – United Way of Northwest Louisiana has collected more than $2 million during the past year to invest back into the community. Those dollars are made up of fundraising, sponsorships and donated goods. The dollars raised will be spent on local nonprofit programs with a focus on advancing education, health, financial stability and those in crisis within Northwest Louisiana. United Way of NWLA leaders and board members shared the good news Wednesday during their annual Celebration of Impact luncheon. The nonprofit honored area businesses and local philanthropists that helped this become possible. The top campaign contributors for 2017 were AEP SWEPCO & IBEW Local 329, Caddo Parish Schools, International Paper – Mansfield Mill, Libbey Glass and Zachry making up more than half-a-million of the total dollars raised. A majority of the funds were raised by hosting workplace campaigns made up of employee and corporate contributions. The Wednesday event also presented the distinguished Clyde E. Fant Memorial Award to community philanthropist Sylvia Goodman. The Clyde Fant Award has been presented to local humanitarians since 1949. Former recipients include O. Delton Harrison Jr., 2015 and Judge Carl E. Stewart, 2003. LIVE UNITED, presented to Libbey Glass for exuding the characteristics of philanthropy, integrity and service throughout the company. Coordinator of the Year, presented to Pam Bollman of Purina Animal Nutrition for bringing passion and excitement to the mill yielding triple the giving since 2014. During the past year, United Way of NWLA funded 77 nonprofit programs; thirteen of which are operated in-house by United Way staff including Dolly Parton’s Imagination Library, Bank On NWLA, the Emergency Food and Shelter Program, FamilyWize, the Volunteer Center of NWLA and more. The announcement for the allocation of these new dollars raised will be held in May.